This week's Fabulous Mom is Rachel, mama to the adorable Brighton and the photographer extraordinaire behind Brisham Photography. She took pictures of Gabrielle and Alaina in Central Park this summer in honor of their first birthday and I was blown away by the results. 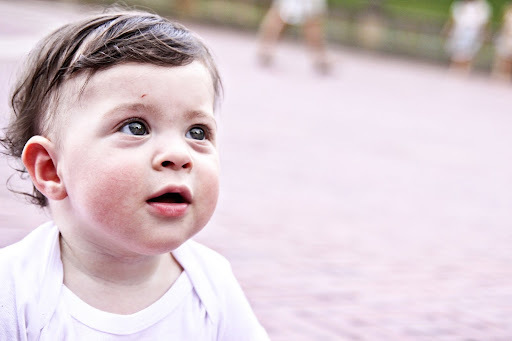 I've learned recently how hard it is to photograph toddlers and the day Rachel took these pictures, it was nearly 90 degrees in a busy touristy location. 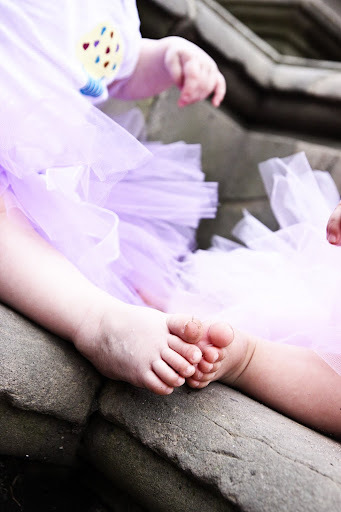 I'm not kidding - plopping down twins in tutus caused quite a commotion among people walking by. See for yourself! But despite all of the challenges, Rachel got so many great shots that I can't pick a favorite. She even managed to get a few nice pictures of the three of us. 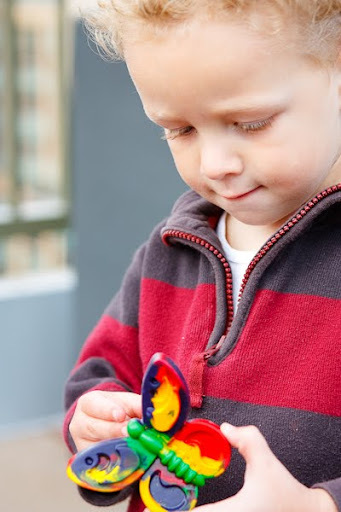 What I love most about Rachel's photography is her attention to small details. How cute is this shot? So you're probably thinking, "Nice photography if you live in NYC but how does this apply to me?" Here's the deal - Rachel is actually based in the Chicago area so if you live nearby, you're in luck. But if you don't, she also schedules travel shoots. She's already got Pittsburgh (next weekend), Park Ridge, IL (November 21st), Indianapolis (November 22nd), Los Angeles (February), Washington DC (March), Boston (April) and Memphis (May) on the schedule and if you can round up of 12-15 people in your area who are interested in having sessions done, she may be willing to head your way too. Why ask someone to travel to take your photos? Besides the fact that she's super talented, Rachel's extremely reasonable session fees include a CD with all of the images and a letter giving you the right to do whatever you want to with the photos. Considering I've paid $200 plus for sessions in the past plus another chunk of change on prints, Rachel's fee is truly a bargain. For wedding, engagement, family, newborn or maternity photos, you really can't go wrong! To see more of Rachel's amazing work, learn more about her pricing or to contact her about a session, visit Brisham Photography. 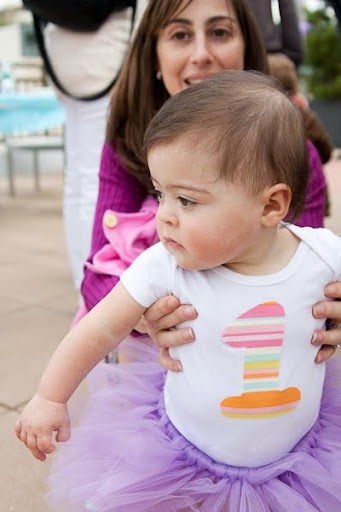 Love Gabrielle and Alaina's adorable Sweet Treat onesies and coordinating tutus? They're from TuTu Cute Designs. I don't think the onesies are up in the store right now, but message the seller if you're interested in having some made. While we're on the topic of photography, I'm very excited to announce a new weekly feature on AFOMFT - the Picture of the Week! Here's how it will work. Every Friday, you'll see a POTW post announcing a new theme. You'll have until end of day the following Tuesday to e-mail your entries to afomft@gmail.com, and on Wednesday, I'll post all of the pictures I receive and open the voting. On Friday, along with new new topic, I'll also announce that week's winner which will be featured on the sidebar of the site until the next one is picked. The person who submitted the winning photo will also receive a prize from AFOMFT. Got that? Good! Let's get this party started! This week's theme is Halloween and I picked a POTW to help get you inspired. This adorable photo comes from Sarah at The Great Umbrella Heist. If you don't already read her blog, you should. Not only does she share amazingly candid stories about life raising identical triplets, but she's also a fantastic photographer. Her photos give me lots of great ideas to try with my girls and always make me smile. This picture was taken when Anna, Allie and Emmy tried on their Halloween costumes and decided to attack the camera. It really doesn't get much cuter than that! Think you have a Halloween-themed photo that comes close? E-mail it to afomft@gmail.com by 11:59 pm EST on Tuesday, November 4th. Only one photo may be entered per e-mail address per week, and you must have the rights to that photo. Please only submit pictures that have been taken within the past three months and if they were taken by a photographer, include their credit. Can't wait to see all of the fabulous photos you have up your sleeves! Congratulations I AM LEE-ANN! 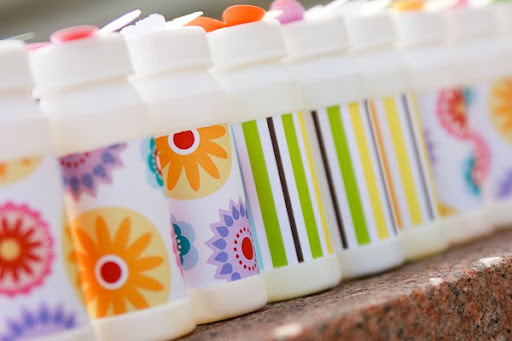 You've won a $20 credit toward a purchase from AE Scrapbooking! Please e-mail me at afomft@gmail.com by end of day Monday, November 2nd to claim your prize. If I do not hear from you by then, a new winner will be chosen. 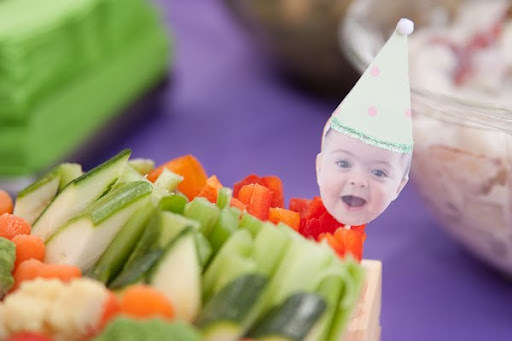 Last Thursday, I started recapping the fun products and projects from Gabrielle and Alaina’s first birthday party in this It’s Party Time post. Now it’s time for part two! But also the food at the buffet. 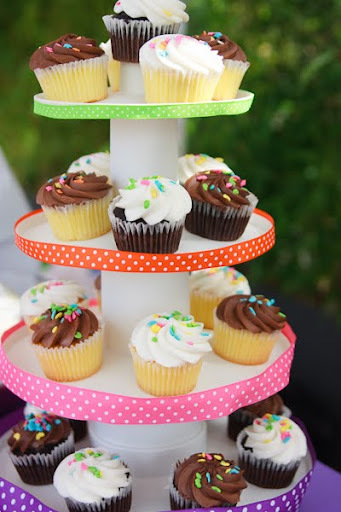 The super cute Monogrammed Cupcake Toppers were from Lil Boo and Co. and I just love how they look hand stitched. They come in sets of 12 so I got 4 g’s for Gabrielle, 4 a’s for Alaina and 4 of the number 1. 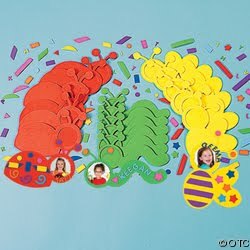 Lil Boo and Co. has so many options for these toppers – different shapes, fonts, colors and more – so you’re sure to find something that fits with your little one’s party theme. A fellow MoM made the adorable picks with Gabrielle and Alaina’s pictures on them. I don’t know if you can tell in these photos but the crowns had actual rhinestones on them and the birthday hats had pom poms. The picture picks were such a big of hit with our guests that people took them home as souvenirs! 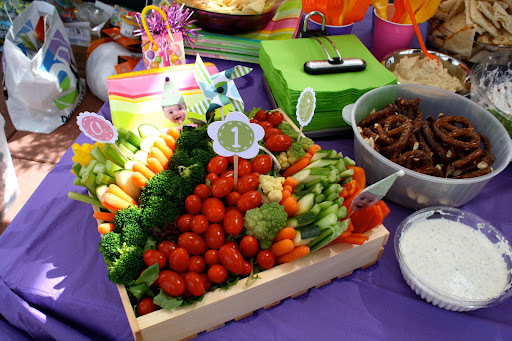 I had to grab the last two out of the veggie plate so I’d have them to put in the girls’ scrapbooks. My friend, Sara, who made them is in the process of opening a shop on Etsy but if you’d like to place or order in the meantime, visit Peanut and Pumpkin Design for more information on how to do it. But the picks weren’t Sara’s only contribution to the party! 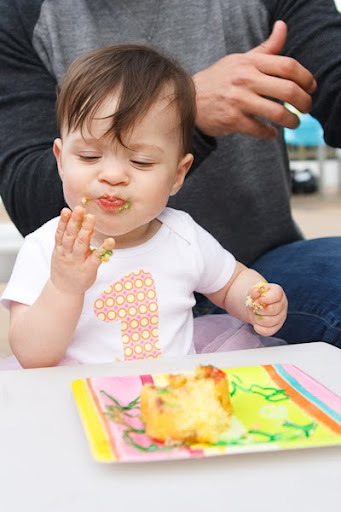 She also made the fabulous “1”sies (as I like to call them) that the girls changed into for the cake smashing. Their “1”sies had coordinating fabric appliqués and the sweetest matching hats which unfortunately, my monkeys refused to wear. You can get birthday onesies, initial tees and more at Peanut and Pumpkin Design. In my opinion, every birthday girl, regardless of age, should wear a tutu, and Gabrielle and Alaina loved theirs! 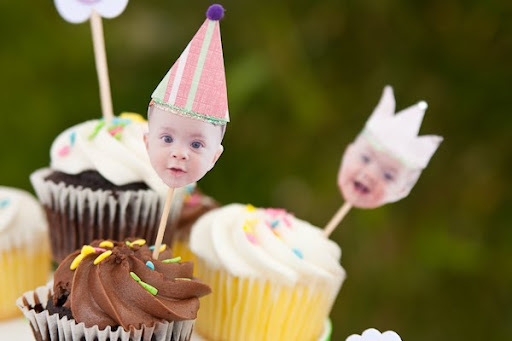 They were made by another MoM friend, who sells them through her Etsy store, Tutu Cute Designs. She has lots of colors to choose from and you get a matching headband free with each tutu order. Can’t go wrong with that! Now onto the party favors. 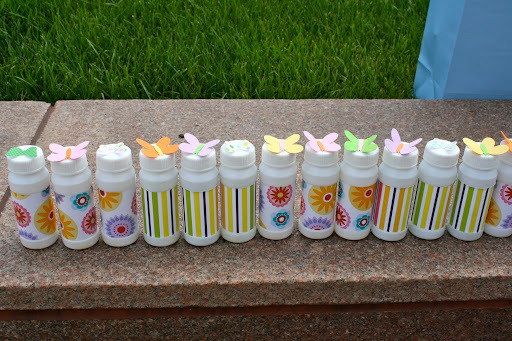 You may remember a while back, I posted about a Recycled Chunky Crayon project and how I made a bunch of Butterfly Crayons for Gabrielle and Alaina’s party. Well, guess what? The kids loved them! 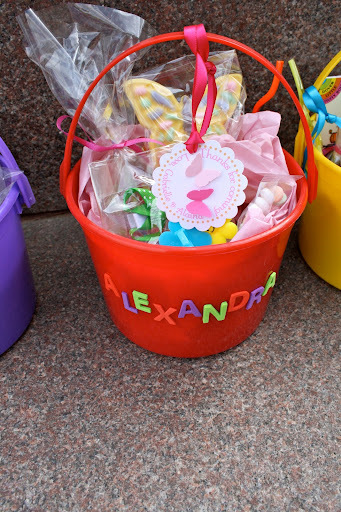 They were part of the favor buckets (purchased from Christmas Tree Shops) that I personalized using foam letter stickers. 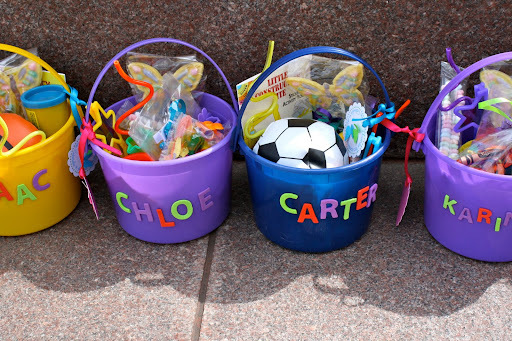 Besides a crayon, each child also got a slinky, some butterfly tattoos, star-shaped sunglasses, a silly straw, some play doh and a few other little trinkets I got from Oriental Trading and Party City. 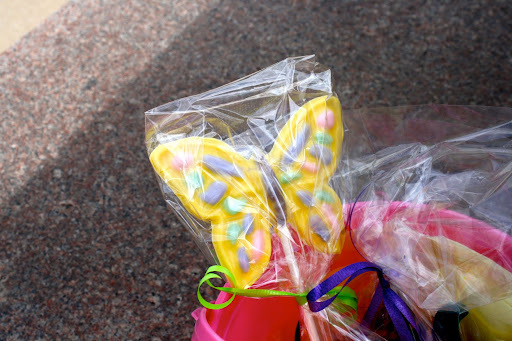 They also had homemade chocolate butterfly lollipops courtesy of my mother. 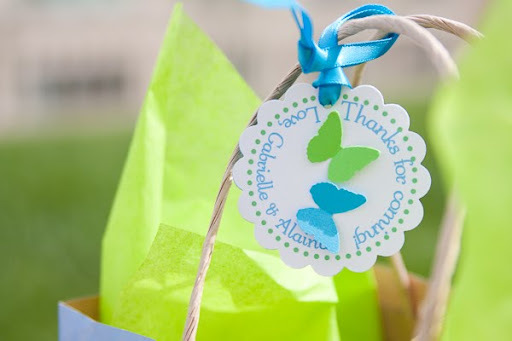 We also had coordinating cupcake toppers with the 3D butterflies on them but I think the favor tags were one of my favorite elements at the party. Kristen, the store owner, made them for us in three different colors and they were the perfect finishing touch on the favors. The kids loved putting them together almost as much as the enjoyed playing with the Butterfly Bubbles. The bubbles were so easy to make and I love how they turned out! 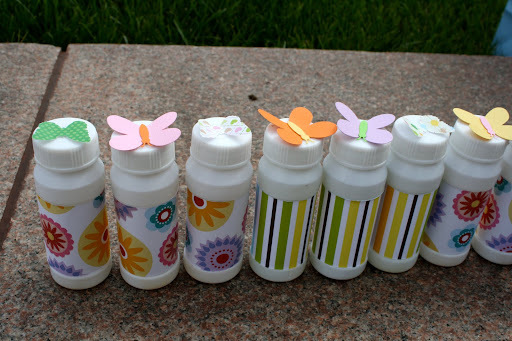 I simply took some bubbles (I highly recommend ordering the label-free bottles from Oriental Trading), cut some scrapbook paper to fit the bottles, attached it with double stick tape and glued a butterfly on top. 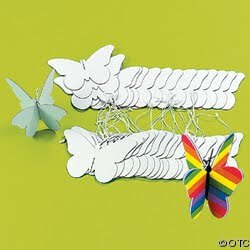 We made most of the butterflies with a Martha Stewart punch. 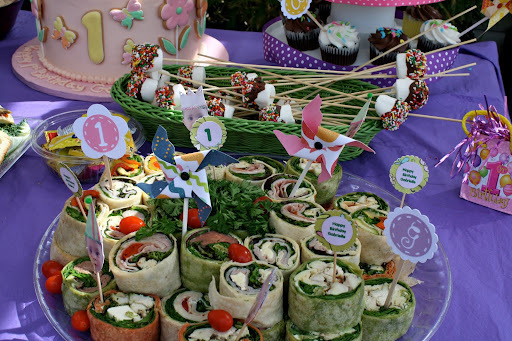 Now you have all of the details of Gabrielle and Alaina’s first birthday party. 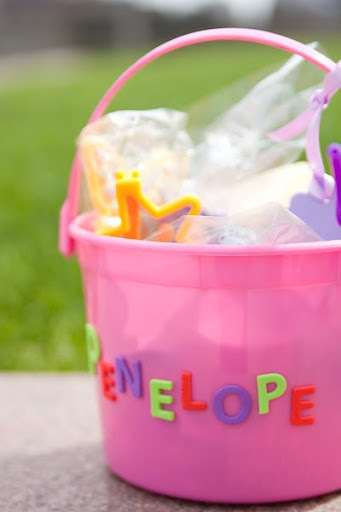 Were you inspired to try some of these projects yourself or do you have some fun ideas from your little one’s birthday bash that you want to share? E-mail afomft@gmail.com with the details and some pictures and your party could be featured on AFOMFT! But that’s not all! 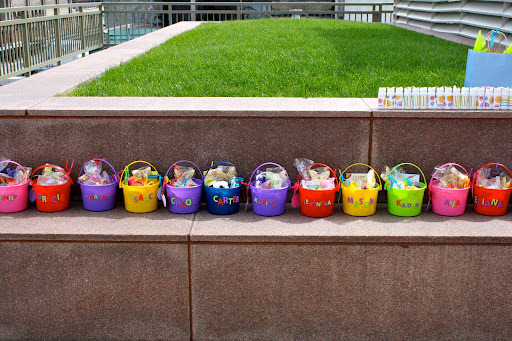 I’ve got two great new giveaways for you. Check out the posts below for more info and don’t forget to visit this post to enter to win the banner of your choice from AE Scrapbooking before 11:59 pm EST tonight! 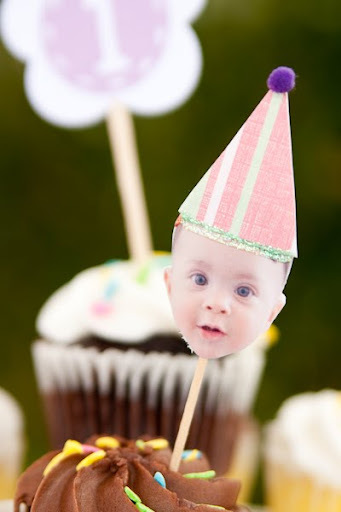 Mary Had a Little Party has graciously offered to give one dozen personalized cupcake toppers to a lucky AFOMFT reader! Follow AFOMFT on FB by clicking the link on the right side of the blog. 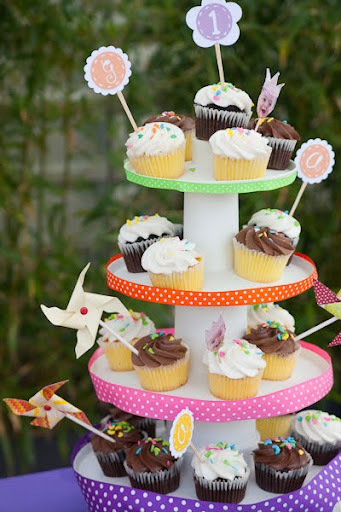 Visit Mary Had a Little Party's blog and become a follower. 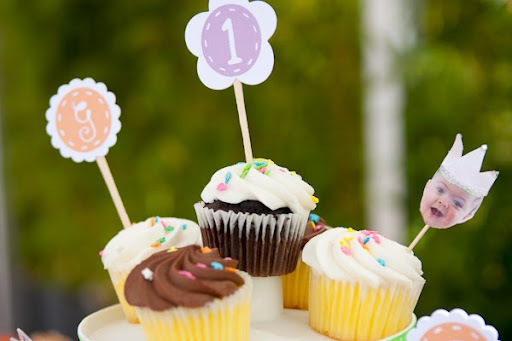 Visit Mary Had a Little Party and add her store to your Etsy favorites. Please leave a separate comment for each entry and make sure to include a link to your tweet, blog post, etc. This giveaway is open to residents of the U.S. and Canada and ends November 5th at 11:59 pm EST. 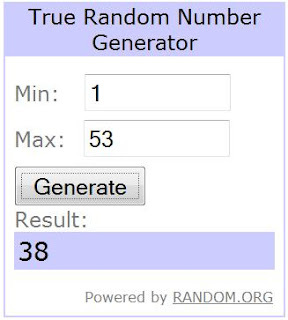 The winner will be selected by random.org and announced on AFOMFT on November 6th. If the winner doesn't contact AFOMFT within 48 hours, a new drawing will be held so be sure to check back to see if you've won! 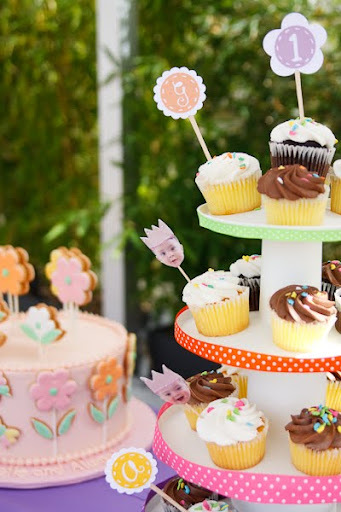 Love the Monogrammed Cupcake Toppers from Lil Boo and Co.? You’re in luck because can win a set of your very own! Visit Lil Boo and Co. and add the store to your Etsy favorites. Visit the Lil Boo and Co. blog and become a follower. Images: Lil Boo and Co.